A two-hinged frame is analyzed in the add-on module FE-LTB. The columns and frame beams are grouped in sets of members. Why is the restraint moment of the frame beam to the columns not considered? 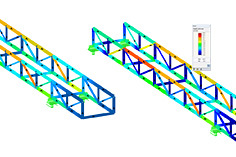 The restraint moment of the frame beam in the columns is not considered, because the sets of members were defined separately for the frame beam and the columns. FE-LTB imports only the model data and loads (individual and member loads) that belong to the corresponding set of members. Internal forces from RSTAB are not considered in principle. Therefore, you must try to model the structure as realistically as possible in the FE-LTB module. By introducing the 7th degree of freedom (warping), you cannot use the previous internal forces. Therefore, remove a set of members from the system, and thus also the corresponding loads, and specify the corresponding boundary conditions (supports, hinge, springs). The warping torsion second-order analysis yields different internal forces, which refer to the loading and structural system previously defined in FE-LTB. Now, if you want to consider further internal forces from adjacent structural components, you must additionally define these internal forces as concentrated loads or also as line loads in the system. Moreover, you can add further loads in FE-LTB, which are important only for the calculation of internal forces in FE-LTB. For an easier lateral-torsional design of the frame in FE-LTB, it is best to define a single set of members over the frame. For the stability analysis with the FE-LTB add-on module, it is necessary to specify the application of imperfections. In this case, not just the initial deformation is used for each member, but the eigenvector is normalized to the defined value. For more information, see the FE-LTB manual.